Who doesn't love chili? It's become an all-American food with flavors and ingredients pulled in from all over the world. Chili is simply a thick stew, usually made with beans and tomatoes, that may include meat, onions, and other vegetables, and always has lots of spice. One note: I like my recipes mild, so there may not be enough spice in these recipes for you. As with every recipe, season to taste! Enjoy! This recipe is the best; it's suave, smooth, spicy, and chunky. Tender chunks of beef instead of ground beef make this chili rich and delicious. You'll love it! This delicious recipe has the best texture and flavor, all because of the fourth bean - my secret ingredient! This is a fabulous way to use leftover meatloaf! The only work in this recipe is chopping some onions. Well, you do have to stir in a cornstarch slurry at the end, but that's it! We love black beans. They are a great substitute for kidney beans in a traditional chili recipe. 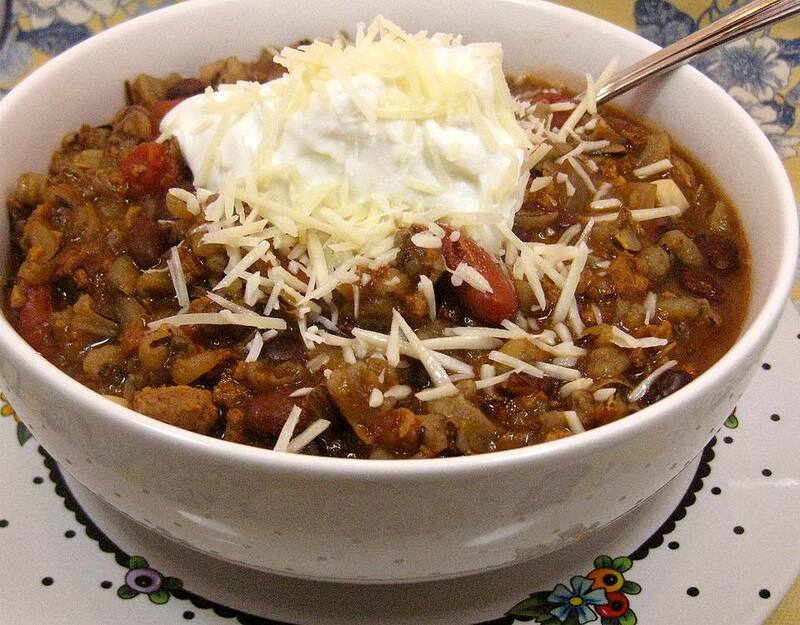 Wild rice is a great addition to a simple basic chili recipe. Frozen precooked meatballs are a wonderful addition to any chili recipe. Use them instead of browned ground beef to save a step. In just about 30 minutes, you'll have a hot and hearty chili on the table. What could be better? This recipe was developed specifically for the freezer. Make a big batch, freeze it, then thaw and reheat it on a super busy day. This is the classic recipe, using ground beef, onions, chili powder, and beans. Serve with Cheese Crackers and a fruit salad. This wild rice chili is made with ground beef, or if you prefer you could use those fabulous frozen meatless crumbles to save time. Chili and the crockpot were made for each other. In fact, you don't even need a recipe with this method! Just pile in beans, cooked meat, onions or celery, then add canned tomatoes, tomato sauce, and spices, and turn it on. Come back eight hours later and eat! All chilis can be thickened at the end of cooking. Just make a slurry: mix a couple of spoonfuls of cornstarch with some cold water until dissolved, then add it to the chili. Cook stovetop chili for another 10 minutes, crockpot chili for 30, until the chili thickens and blends.